Accessories: Accompanied by Patek Philippe Extract from the Archives confirming production of the present watch in 1976 with yellow gold bracelet with stones, 154 diamonds totaling approximately 2.06 carats, 8 cabochons onyx and 11 chrysoprase and its subsequent sale on July 22, 1976. Provenance: From the collection of Catherine Deneuve. From the collection of Catherine Deneuve. 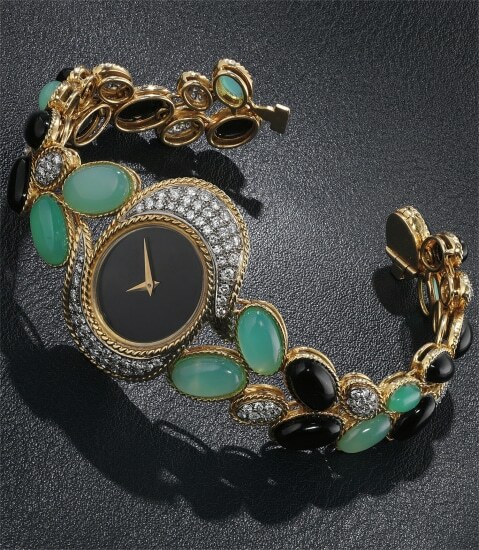 It is with great honor and pleasure for Phillips in Association with Bacs & Russo to offer the present timepiece - a stunning and exquisite Patek Philippe bracelet watch lavishly set with diamonds, onyx and chrysoprase, hailing from the collection of award-winning actress, model, producer and activist Catherine Deneuve. An original multi-hyphenate, she is France's cultural symbol and archetypal actress, having starred in multiple zeitgeist-capturing films that span decades. Born Catherine Fabienne Dorléac, Deneuve made her film debut in André Hunebelle's Les Collégiennes at age 13. While the then-fledgling actress landed her breakout role in The Umbrellas of Cherbourg, it was not until she starred in Belle de Jour that she became a true cinematic icon. Through the subversive and transgressive masterpiece, Deneuve pushed the boundaries of propriety and convention. Donning Yves Saint Laurent from head to toe, protagonist Séverine Serizy and by extension Deneuve herself, embodied the Parisian spirit of beauty, charm, style and wit. The movie received countless plaudits and the actress transformed into the instant darling of the cinematographic world. Catherine Deneuve's accolades are endless. With an Honorary Palme d'or under her belt and having received over 14 French Cesar Awards nominations, Deneuve has starred in over 100 films. Today she is still heavily active and involved in the world of Arts. In 1985 she became quite literally, the symbol of the French Republic, officially becoming the embodiment of Marianne, the personification of liberty and reason and a portrayal of the Goddess of Liberty. This yellow gold bracelet watch perfectly encapsulate's the icon's elegance and style. Designed with undulating diamonds, onyx and chrysoprase, it boasts workmanship that is next-to-none and showcases Patek Philippe's unparalleled workmanship. Reference 4321 was produced between 1976 and 1978. Each example was produced piece by piece, each offering a slightly different variation of stone and shape. The reference perfectly captures the spirit of the era - its sloping forms, radical shape and expressive design showcases the ideals of freedom, design and self-expression of the 1970s. It thus comes as no surprise that a boundary-pushing icon such as Catherine Deneuve would choose such an arresting timepiece for her personal collection.